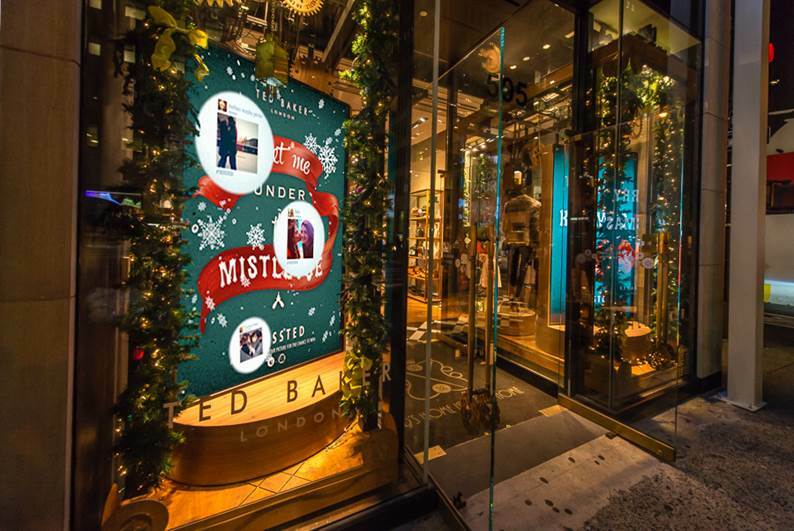 To celebrate the launch of their Christmas campaign, Ted Baker has created a large scale digital Mistletoe installation situated on top of store entrances, exclusively at three stores globally, titled ‘Merry Kissmas’. 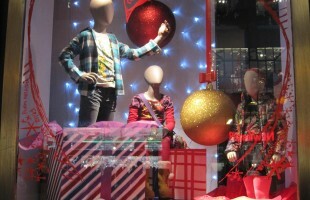 The three stores participating are New York 5th Avenue, London Westfield and Tokyo’s Omotesando. 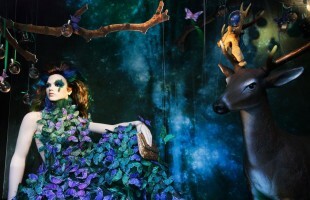 To sit alongside this exclusive window scheme designed and realised by Kin Design, Ted will also be hosting a digital and social media ‘Meet Me Under the Mistletoe’ campaign, where Ted Baker will call out to customers and members of the public around the world, passing by or visiting the select stores to take a photo under the mistletoe. Utilizing personal Twitter and Instagram profiles with the hash tag #KissTed they will then automatically be entered into a competition to win a romantic luxury holiday for two. Ted Baker asked Tangible Interaction to create a custom social media visualizer for their campaign. It’s based on their Social Mosa (twitter and Instagram Wall) application created for the event industry. 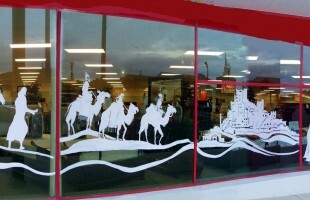 The Tangible Interaction team redesigned the visualizer to incorporate campaign branding and added windswept snowflakes. Also in the generative animation, falling snowballs provide a canvas for tweets and Instagrams. The “Merry Kissmas” visualizer displays on screens installed in the Ted Baker 5th Ave, NYC store windows until 22nd December. 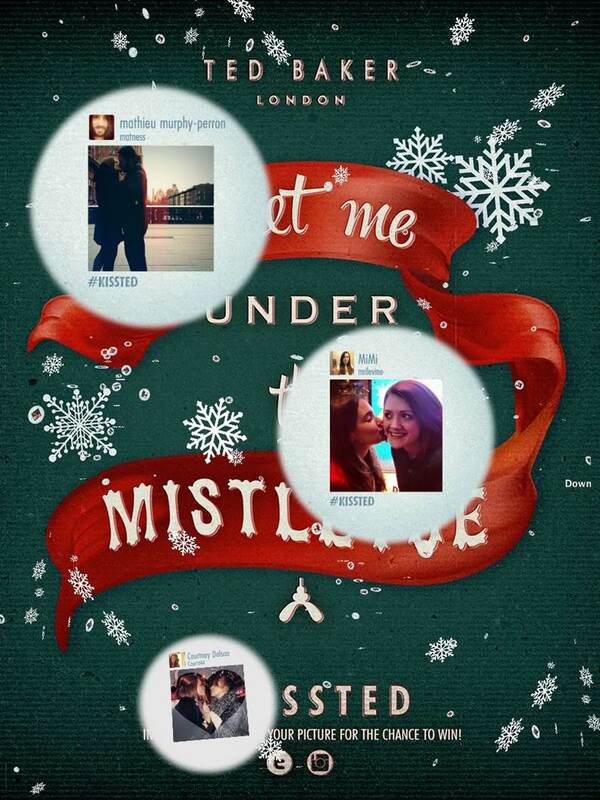 To take part, customers take ‘selfie’ photos kissing under the mistletoe installation. They tag them #kissted and post to Instagram or Twitter. Before any tagged photo is included in the visualizer, it’s quickly filtered for suitability by Ted Baker US staff using Tangible’s social media content ‘Monitor’ tool on an iPad. The whole process from posting to visualizer takes only a few seconds. The result is a beautifully designed seasonal animation that not only grabs attention at street level but also generates positive buzz about Ted Baker online and encourages social media echo. Social Mosa displays crowd-sourced tweets and Instagrams in a generative animation on venue screens. Think of it as a live conversation visualizer. Using their own smartphones, event guests tweet and send Instagrams with the hashtag created by you. 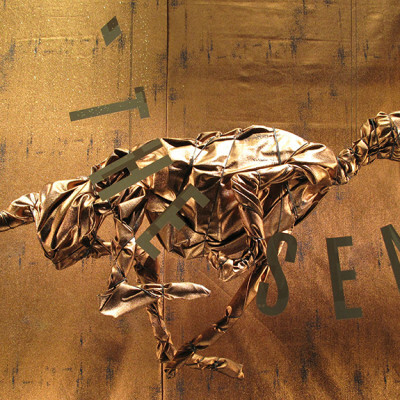 Social Mosa continually searches for that content, then grabs and pulls it down into the Mosaic animation. Along the way, every tweet and Instagram is manually filtered using the company’s Monitor application. It’s a quick, simple process that guarantees negative comments or images won’t make it to screen.